Northeastern University, we won’t be complicit! 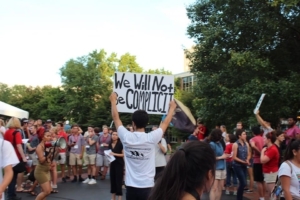 On July 23 at least one hundred activists affiliated with the pro-immigrant rights group Movimiento Cosecha marched onto Northeastern University’s campus and “dis-oriented” a student orientation for incoming freshman to the university. The march took aim at Northeastern University, which has come under criticism for having a $2.7 million dollar contract with Immigrations Customs and Enforcement. The university has claimed the maintenance of their contract is about protecting “academic freedom” while dodging the fact that any assistance to ICE, which has and does commit acts of terror on thousands of immigrants and their families, has violated several human rights. 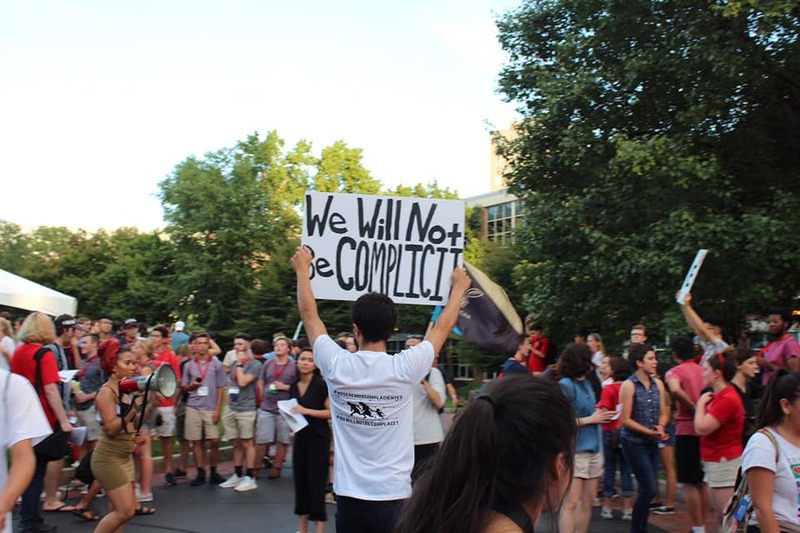 The march’s theme was captured with the “We Won’t Be Complicit” slogan demanding that the University drop its contract immediately. Students and staff have signed a petition started by Boston activist Evan Geer, which now has thousands of signatures demanding Northeastern University drop the contract. The march began off campus, at a nearby park and took to the streets with lively chants like “Outraged and unafraid, immigrants are here to stay!” and “From Palestine to Mexico, border walls have got to go!” The march was electrified with music provided by the activist street band BABAM. Welcome to [dis]orientation – Will you be complicit? 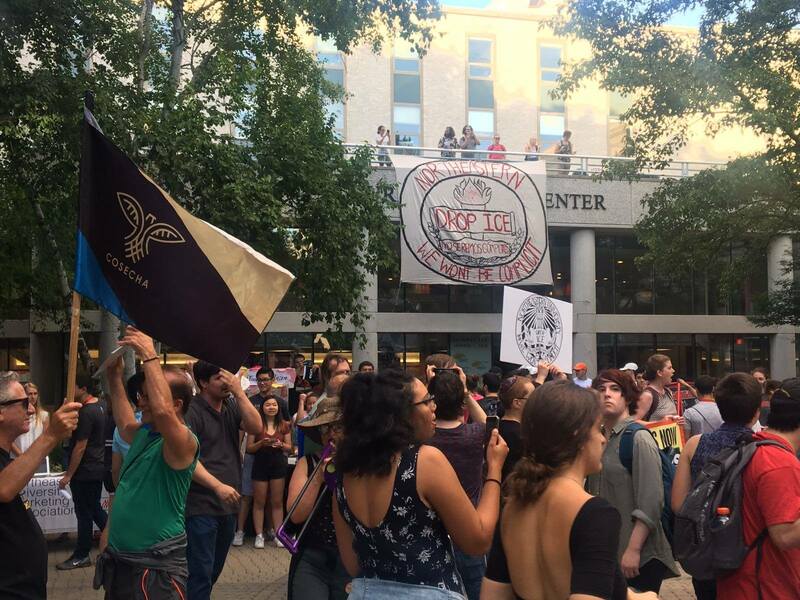 The demonstration moved from Ruggles station to Northeastern’s campus and disrupted a student orientation for incoming freshmen at the university. 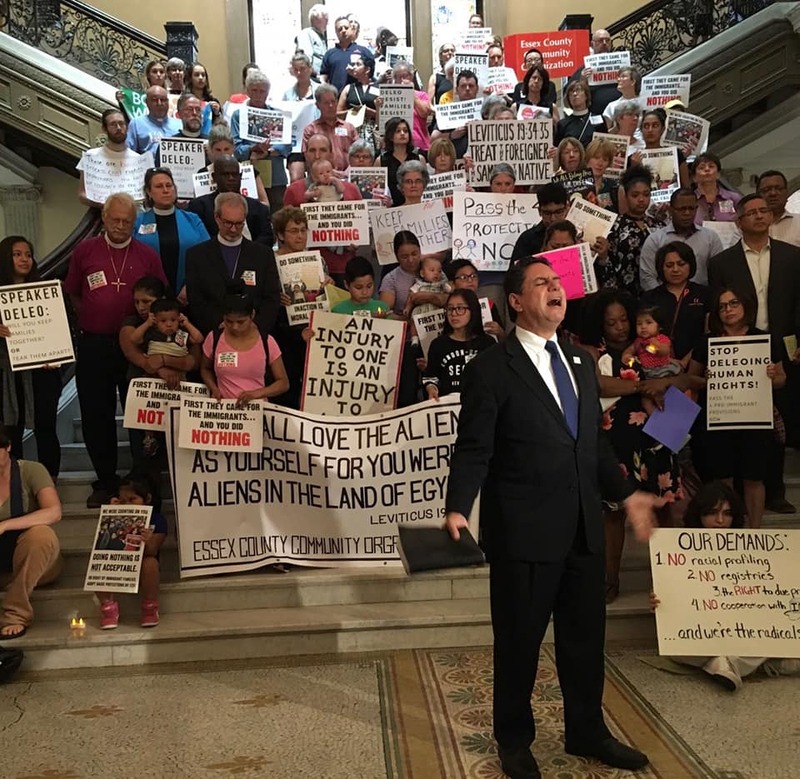 On the following day hundreds of people gathered at the Massachusetts State house to decry the lack of decisive action taken by Massachusetts legislators to protect all immigrant families. The action was called by several organization such as: Pioneer Valley Workers Center, Massachusetts Community Action Network, Salem No Place for Hate Committee, Episcopal City Mission, Neighbor to Neighbor Lynn, Essex County Community Organization, Massachusetts Immigrant and Refugee Advocacy Coalition. Liberation News spoke with Scott Sternberg, activist with the Essex County Community Organization. Liberation News: Why did you decide to join this protest? Scott Sternberg: When the Safe Communities Act didn’t pass, we were disappointed that at a time when Democrats have a supermajority in the house and they didn’t pass anything in support of immigrant families. We had outlined four major things to focus on after the act didn’t pass focused around: 1) ending police collaboration with ICE 2) defending immigrants rights to due process 3) ending all collaborative agreements between the state and ICE and 4) not having a discriminatory registry that traps people based on their national origin. We decided to join with other groups to demand action from our legislators before the end of this legislative session. Liberation News: Why do you think there has been no action from the Democrats, even with their supermajority? Sternberg: Well, we have a Republican governor who said he would veto the Safe communities act, without even reading it, so a lot of the Democratic leadership were not willing to present things the governor would veto. But, the real risk is not whether or not he will or will not veto the act; the real risk is to the immigrant community. All progressive and revolutionary people should be in agreement. We cannot wait on the two capitalist parties who created this crisis to solve it. Any substantive change for the masses of undocumented immigrants and for the working class as a whole has to come through mass-based struggle that targets those in power. We are reminded of the great abolitionist Frederick Douglas in his “West India Emancipation” speech: “Let me give you a word of the philosophy of reform. The whole history of the progress of human liberty shows that all concessions yet made to her august claims have been born of earnest struggle. The conflict has been exciting, agitating, all-absorbing, and for the time being, putting all other tumults to silence. It must do this or it does nothing. If there is no struggle there is no progress. Those who profess to favor freedom and yet deprecate agitation are men who want crops without plowing up the ground; they want rain without thunder and lightning. They want the ocean without the awful roar of its many waters.